Solar energy is experiencing massive growth in Boise. In large part, the growth is thanks to Boise solar incentives. These are being given by the government, state and utility companies to people or businesses that choose to go solar. We have some of the least expensive energy rates in the country. That may also be why we consume a bit more energy than the national average. So even with our low electric rates we still see higher than average electric bills across Idaho. 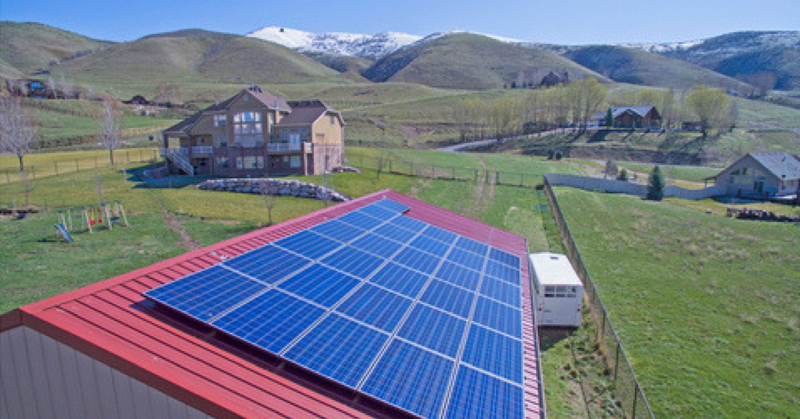 With solar Idahoan are able to lower their monthly expenses while working towards true ownership of their solar system. There are 4 main financial incentive programs in Idaho for clean energy consumption and we want to talk about all of them! Although not specifically a city of Boise solar incentive. These are programs launched in 2015. They offer low-interest loans to homes and business owners that want to make upgrades to their buildings in an effort to consume less energy or use renewable sources. These upgrades include insulation, lighting upgrades, windows, weatherization, HVAC, appliances among other types of projects. Loans are helpful because they allow homeowners to go solar with $0 downs and nothing out of pocket. The loan will be less each month than the current electricity charge the homeowner is paying. So you save money from the first month your solar goes on! Once the system is paid off you eliminate that bill entirely! The loans can vary from 2.99% and up for 7-20 years. Most homeowners in Idaho will pay off a loan in about 12 years. and since our solar panels are guaranteed for a minimum of 25 years you will easily get a massive ROI. Almost all utility providers in Idaho have a great Net Metering buyback program. The Boise solar incentive for net metering is definitely on pace with the state. Net metering allows you to sell any excess energy that you generate during the day back to the utility company for credits. These credits can then be used anytime your system does not produce enough energy to meet the needs of your home. We like to think of it as a rainy day fund. A good example is that most homes generate more electricity than they need in summer but not enough in winter. So you can save those credits all summer long and still have no electric payments when winter comes. Credits never expire and can be carried year to year in most cases. These same programs are available for solar panels in Meridian and Nampa! There are currently two types of grants available for renewable energy in Idaho. The first is MACRS which stands for modified accelerated cost recovery system. MACRS provides for deductions up to 100% of the qualifying property, in this case, a solar array system. This is mostly available to businesses but can also help residents who rent a property, run a small business from their home or participate in incoming generating activities based on their owned property. Read more about MACRS here. While for the most part, these programs are intended to help businesses there are also other types of incentives for individual homeowners who don't qualify for these. Boise has great tax incentives for residents that choose to go solar! Idaho State offers a $20,000 Tax deduction for income taxed by the state. The Federal Government is also still offering a 30% tax credit. But don't wait too long! The Federal tax credit is starting to be phased out at the end of 2019 and will decrease each year until 2021. Tax credits depend a lot of your income and tax liability and we are not CPA's. We highly recommend always running any solar quote and estimated savings by your CPA to ensure full utilization of the savings. If you do not have a CPA we are happy to help refer you to one that we know specializes in solar incentives for tax purposes. Want To Find Out What Solar Incentives You Qualify For?